Karen’s experiences with clay started way back when she used to play outdoors in her backyard, using mud, sticks and pinecones to create animal sculptures living in a make-believe forest. As a Kindergarten and early Primary teacher, she noticed how her students loved to use their hands to create and mould materials, not just playdough or plasticene, but any gelatinous, malleable substance... sand, mud, paint, goop, dough, even glue... they all attracted children who liked to get their hands mucky! Because she, too, liked to work with her hands, this fascination lead her to join the Guild, and to do some “mucking about” of her own during a variety of handbuilding and wheel classes. Now, she enjoys sharing this opportunity with children of all ages, encouraging them, not only to create a variety of projects out of clay, but to discover the fun in“just mucking about”. Her motto: Playing with clay needs to be fun! Brian Edward Barry was born in Hampton Ontario on February 25,1958. He had a keen interest in the arts, especially using lead pencil and creating high realism drawings. he continued honing his drawing skills but felt that he needed more expertise. After his marriage to Miriam in 1983, he began attending the Beal Secondary post graduate Art Program in London Ontario, that involved several studios of various mediums including pencil drawing, painting, fabric design, art history, and of course, work in clay.. affectionately called the ceramics class. He did not feel that he was an adaquate sculpter, which most of the students opted to do in the class. Brian convinced Bevin Ling that he should teach him how to use the potters wheel. Beven talked him through the process and Brian succeeded in making a cylinder. He continued to hone his skills in pottery and joined the London Potters guild when it was located at Banting High school. Brian purchased his first potters wheel in 1985 and his first kiln from the Sisters of St Joseph. He set up his first studio on King St in an auto body shop and then moved the studio to Stacey's Schoolhouse in Dutton Ontario on a country road called Starvation St. which has since been changed to Pioneer Line. Brian's love for functional pottery has evolved through the years. He prides himself in being able to make a 'drip proof tea pot' from porcelain clay, his clay of choice, although he has used stone ware on a number of occasions. Brian's glazing evokes thoughts of scenery and landscape through the use of blues, reds, and greens. He has also used the white base of porcelain clay to create high realism drawings on his work. Brian has participated in many guild exhibitions and sales. He has done work for Hutton House, Pinecroft Pottery, Toronto Galleries and one of a kind shows and commissions. Brian also uses his pottery skills in ministry work as an analogy of life and Biblical characters. 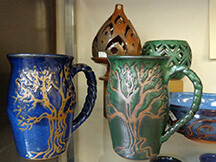 ​Brian is passionate about creating the best and most functional pottery. He is also passionate about teaching his students. Giving them skills and an interest in an art form passionate to him. She throws and glazes her own forms from high fire brown stoneware clays. I use various decorating techniques giving a flavour of years gone by and of nature, techniques range from burnishing (the earliest form of compacting the clay with polished river stones), wax resist design, carving and various sculptural techniques both on her pottery and as solo pieces. Shelley has also taught pottery classes for the past 10 years to people of all ages and enjoys sharing her creative process with her students and assisting them in discovering their own creativity. "I have taken pottery with Shelley Boa for about 7 years. She always encouraged me to go with my inspiration, to try things and enjoy the experience of creating. She is one of the most patient people I've ever met, never gets flapped and never criticizes. She has helped me learn her craft (although I could never be as gifted as she is) and has shown me how to save pieces that I thought were hopeless. These days it is a magical feeling to be able to work in such an ancient medium, producing handcrafted pieces that enhances people’s everyday lives with a little more soul and remind people in this high-tech society that not everything has to come off an assembly line. In late July of 2009 I underwent a life-changing experience when my horse stumbled at a full gallop; and I flew off her into the ditch. I don’t remember the fall. When I awoke, my left hand was at an awkward angle and the entire right side of my body was in pain. I had a badly broken wrist and a slight displacement of my C5-6 disc. Six casts, dozens of x-rays, one surgery, 2 sets of physio-therapy and 18 months later, I was finally able to return to pottery making. I spent the first 24 years of my pottery life making fully functional forms. My comment when asked about my style was always “if you can drink out of it or eat off it, I make it”. The fall, and slow return to “normal”, has changed my outlook. I found myself purchasing things for my home that made me smile, not worrying about their function. Now, when you look at a piece of my pottery, I want YOU to smile. I want you to look, and find the “fun” in my pieces. While the majority of my pieces are still able to be used (functional), I’ve added a “fun factor” whether it’s an interesting foot design; or lady bugs on the rim. I hope you enjoy having them in your home as much as I enjoyed their creation. Nancy was born and raised in London, Ontario. Studying art in Fanshawe College, Johannesburg Art Foundation and Nippissing University allowed here to be introduced to a wide variety of art forms and practices. Upon Nancy's return to London, Ontario she “rediscovered” her original love for pottery, one of her earliest artistic pursuits. She joined the Potters’ Guild in 2006 and loves working in such a dynamic community of artistic energy. Nancy is currently enjoying an exploration of varied techniques used to alter standard forms. Joanna has always loved to draw and the main themes of her artistic endeavors have mostly focused on the human face, with an emphasis on its varied facial expressions. 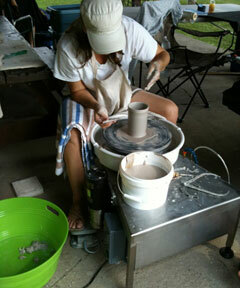 It was at Beal Secondary School (Arts Foundation Program) that she discovered her passion for working in clay. In 2007 she dedicated herself to a full-time career as a sculptor and mask maker. Since then, she has created numerous unique masks designs and ceramic sculptures. Her work might be found in private collections all over the world. ​Jane Paterak’s love of clay began in the summer of 1988 when she took her first pottery class with Mary Haggis. Jane has always been a creative person. When she was first introduced to clay through hand building and wheel throwing, she realized how much there was to explore and develop. Clay had become her medium of choice. Since taking that first pottery class, Jane has taken numerous courses through Fanshawe and with local potters. She has also participated in workshops with Canadian and US Artists, each teaching and influencing her work in some way. Clay is a medium that allows her to create forms that are both visually beautiful and three dimensional, inviting physical interaction and appreciation. She is drawn to the art form and craft because you can create artful pieces that weave into your daily lives and rituals. Her work is mostly functional. She works with stoneware, creating wheel thrown work that is decorated with texture, slip and altered with hand built features. Her interests lie in the form. 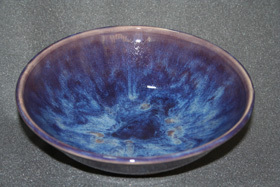 The glazes she chooses are monochromatic and semi-transparent to highlight the texture and form beneath the glaze. Her decoration is inspired by nature, has flowing lines that are subtle yet strong. Jane has participated in many guild exhibitions and sales and is passionate about creating quality functional work that is unique and her own. She is also passionate about sharing her experience and teaching those skills to students so they may also appreciate the art form and start their journey into clay. Chris Snedden has been a potter for over 20 years in the London area, and has worked in almost every facet of the pottery business, from building electric kilns and teaching courses or workshops, to producing and distributing giftware for the international market. Chris’s work continues to be shown at festivals and galleries across Ontario. Chris continues to teach, give workshops, and develop his award winning work. Kyle attended the Sheridan College ceramics program. He studied under Bruce Cochrane, Dale Pereira and Tony Clennel. During Kyle’s summers he worked for Jackie Seaton of Perth, ON and Tim Smith of Wiarton, ON. He threw hundreds of pots in each of their studios as well as aided them in all aspects of running a pottery. ​Kyle built his own pottery wheel which he uses to make functional kitchenware. Clay forms, decoration techniques and the joy of physically creating an object, based on an image in my mind’s eye, came from the influence of my mother. She became involved in ceramics during my late public school years and I learned as she did and continued to do so through high school and college. I joined the Potters Guild in September of 2005 and have not looked back. Last year I was the artist in residence for the Guild and I learned a lot about clay. I would like the opportunity to pass what I have learned on to you through the classes offered by the Guild. I have been an artist as long as I can remember, always drawing, painting and getting dirty. I attended Beal Art in London as an interdisciplinary student and earned a Technological Studies Certificate in Vocational Art. Four years at the Nova Scotia College of Art and Design resulted in a Bachelor of Fine Arts, Major in Ceramics and a love of clay. While in Halifax I worked as a potter’s assistant for two different potters. After graduation I joined the London Potters Guild as a studio member. I became Artist In Residence and later Studio Technician as well as beginning my teaching career with adults and kids courses, which I still enjoy teaching there. I am also teaching Ceramics at Lambton College in Sarnia.